For the better part of the last century broiler chickens have been selectively bred with one trait in mind: size. In the 1950’s, the average broiler chicken was just one fourth the weight of today’s chickens. On factory farms, bigger hens have equated to bigger profits for decades. Soon, however, that might be about to change. 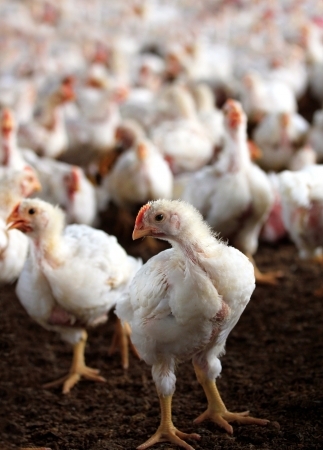 In recent years, broiler hens have begun developing a number of muscle diseases that make breast meat less desirable, and consequently less profitable to farmers. The most notable of these diseases is woody breast, which is a hardening of the muscle fibers that makes breast meat difficult to chew. Meat affected by woody breast doesn’t pose health risks to humans, but it is a quality control issue that’s becoming increasingly costly in the poultry industry. Many researchers have attributed the increasing prevalence of these muscle diseases, at least in part, to the unscrupulous selective breeding practices of factory farms. After years of breeding chickens that get bigger and plumper with each passing generation, some unforeseen genetic consequences have begun to have a negative impact on their health and the quality of their meat. So, in an effort to curb the problem, some poultry producers are trying to grow smaller hens instead. Recently, Joe Sanderson Jr., CEO of the third largest poultry producer in the country, announced that broiler hen weight gains could slow in 2017 for the first time in a very long time. Some chicken customers have even considered requiring their suppliers to transition to smaller hens to prevent issues like woody breast. Keep an eye out – the chickens in your grocery store could soon get smaller, but tenderer as well.